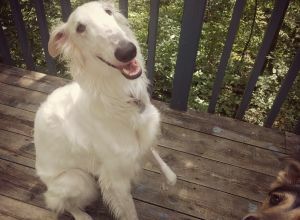 Gemma | Borzoi in Montréal. Gemma is a gentle giant. She is very shy, like a horse and a bit aloof but super gentle and loving. She is still part puppie so not that obedient. I work during the day and would love my baby to get more walks!